Diamonds are one of those unique investments that can be purchased in one currency and sold in another, providing a hedge against inflation that devalues the purchasing currency. Like we’ve mentioned in previous articles, diamonds are tangible investments that are highly portable, easy to store, and of course wearable. Why are Colored Diamonds Getting Rarer? While colorless diamonds are relatively easy to come across, colored diamonds bring a whole new meaning to the word “rare”. More specifically for every 10,000 stones that are mined, only 1 will be a colored diamond. Colored diamonds are becoming harder to find and even harder to mine. Some of the longest producing mines are nearing the end of their profitable life. 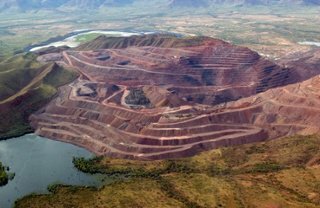 A good example would be the famous Argyle Mine in Western Australia. This mine has been responsible for producing 90% of the world pink diamonds, with a quality unrivaled by any other globally. However, the 2020 closure of the Argyle Mine will not only affect the diamond production industry, it will also greatly impact the investment market, and possibly history as a whole. For more information about these speculations, check out our article here… but for the time being let’s not get off topic. The exhaustion of mines is not the only issue, many companies are also greatly limited by the current mining technology. This means that even if there were hills of pink diamonds, at the levels of current technology it would not be feasible, time effective, or even profitable to extract them. So the question remains, with all the above in mind, how will colored diamond investing change in the future? Fancy color diamonds are seen as a stable asset class, and have been so for some time. 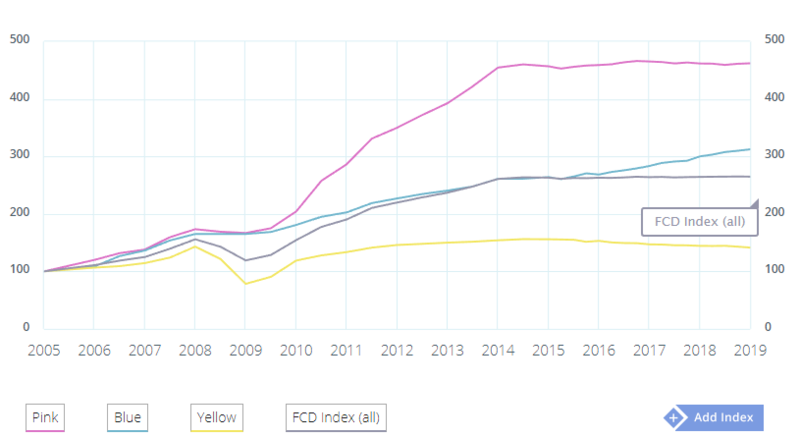 Total appreciation between 2005 and 2019 for pinks, blues, and yellows has been exponential as we can see from the FCDR Index provided below. Truly massive numbers if one takes into account that they were documented during a great financial crisis. It is therefore safe to assume that fancy colored stones are still seen as a safe haven within the industry, as they are largely unaffected by financial turmoil. 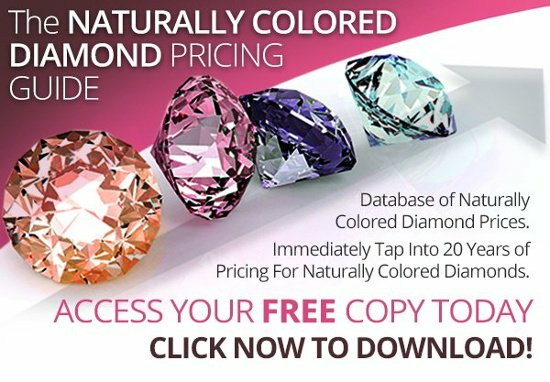 If you're interested in colored diamonds, check out this article to see which colored diamonds are right for you to invest in. As noted, colored diamonds are a stable asset class, and if you take into account the tactics of Joseph Lau, billionaire investor, we can see why. In the last few years, this investor has had a history of purchasing high-value stones for his daughters. These stones, while outside the reach of most individual investors, are nonetheless part of a comprehensive wealth management system that doubtlessly includes estate planning. Stones passed as gifts or held in trust for minor children may be classed as gifts rather than as items of an estate, and taxed at a different rate; or if held as part of a living family trust, may not be taxed at all. Consult your tax experts for specific insight here. A highly competent attorney, specializing in wills, trusts, and estates can help you plan your estate to preserve value, minimize tax hits, and circumvent the probate courts. Whatever your reason for choosing to invest in colored diamonds, you owe it to yourself and your family to educate yourself in your chosen investment strategy. 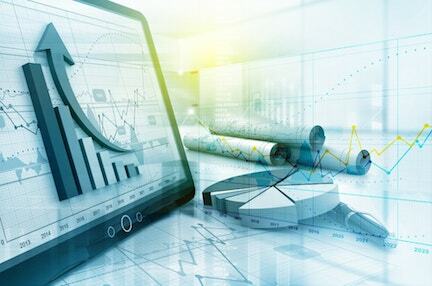 Alternative investments have less liquidity than traditional investments and can require a longer outlook than stocks, bonds, and other instruments. For more reading on alternative investments, click the links below and as always feel free to follow us on Twitter and LinkedIn. How Do Auctions Work For Colored Diamonds?